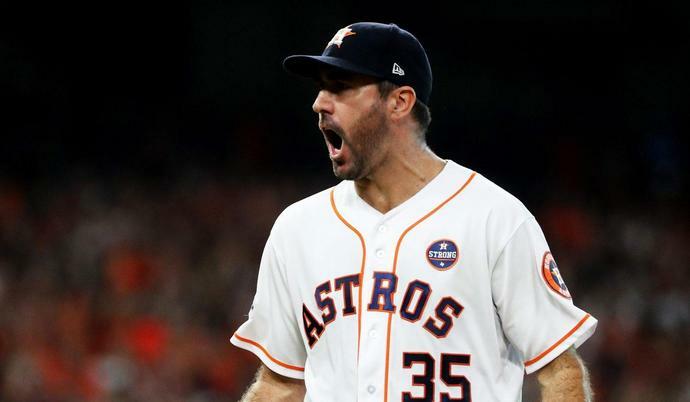 Justin Verlander: "system is broken"
Justin Verlander is not one of those players who are having a tough go of it on the free agent market. He's all set. But he's looking out for his fellow players who are not finding the free agent market as hospitable as he and others who might've a few years back. On a few occasions this offseason he has voiced displeasure with the state of things in Major League Baseball. Some may quibble with 26-36 being a "great performance window" as players tend to peak at the early end of that span and decline as it goes on, but that's not the end of the story when it comes to long-term contracts. One thing that is rarely mentioned is that, while a lot of big long-term deals may look bad toward the end, teams often get more than their money's worth on the front end. In the case of Harper and Machado, cited by Verlander, it's not at all difficult to imagine each of those guys being worth far more than what they'll be paid on the front half of a deal and pretty fairly compensated as they begin to decline. While the last couple of years may look bad, it's likely that they'll have given their teams far more aggregate value over time than that for which they were paid. Such is life when you sign an MVP-caliber 26 year-old. That aside, it's hard to take issue with Verlander in the grand scheme here. Teams may say they can't afford a big contract to Harper and Machado, but they're never willing to give you the denominator in their financial analysis. I suspect there is no team that can't afford them in an absolute sense and that most passing on them simply are unwilling to make that kind of a commitment. Why they are not is a question for which they rarely give you a straight answer and even more rarely give you an honest one. As for "rebuilding," well, we covered that this morning. Verlander is throwing heat today, y'all. That last time Major League Baseball held the All-Star Game in Philadelphia, the year was 1996.